While cracking passwords and WPS setup attacks attract a lot of attention, social engineering attacks are by far the quickest way to get a Wi-Fi password. Wifiphisher is one of the most powerful Wi-Fi social engineering attacks, a tool that blocks the Internet until desperate users enter the Wi-Fi password to allow a fake router firmware update. Social engineering attacks are powerful because they often completely bypass security. If you can trick an employee into typing a password into a fake login page, it does not matter how strong the password is. This is the opposite of attacks where you use the computer's power to try out a huge list of passwords incredibly quickly. Because of the way this attack works, you can not succeed if the password you are attacking is strong and is not in your password list. If you do not know how strong the attacked password is, it can be frustrating because the attack is frustrating. Time and processing power associated with a brute-force attack can make the dry feeling look like a huge waste of resources to let. Instead, tools like Wifiphisher ask questions about the people behind these networks. Does the average user know what the login page of their wireless router looks like? Would you know if it would be different? More importantly, would a busy user who is disconnected and stressed from the Internet still enter the password to activate a fake update, even if he notices that the login page looks a little different? Wifiphisher believes that the answer is "Yes." To test this theory, the tool can select a nearby Wi-Fi network, de-authenticate all users (jamming), and create a clone access point that does not require a password. 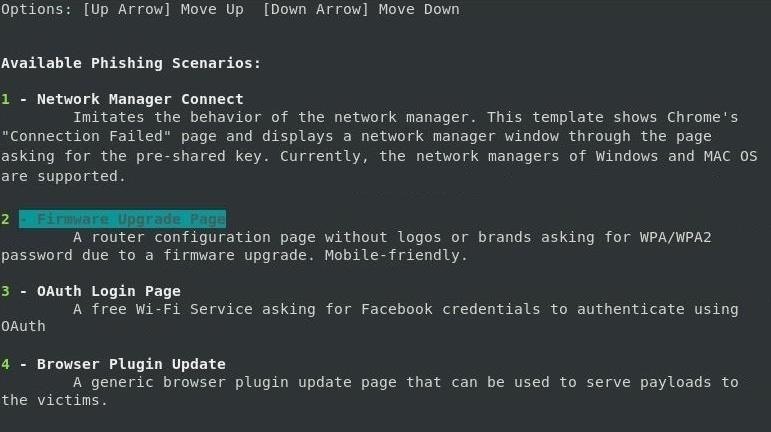 Anyone who joins the evil, twin-network network will see a compelling-looking phishing page that requires the Wi-Fi password to enable a firmware update. This is the reason why the Wi-Fi does not work anymore. In a social engineering attack, the first signs of Wifiphisher look like a problem with the router. At first the WLAN fails. You can still see the network, but every connection attempt fails immediately. Other devices can not connect to the network, and they realize that not just one device, but every wireless device has lost connection to the network. They notice a new network with the same name as the old network but no password required. After a few more attempts to connect to the protected network, they join the open network, worried that their router will suddenly send a network without a password, to which anyone can access. 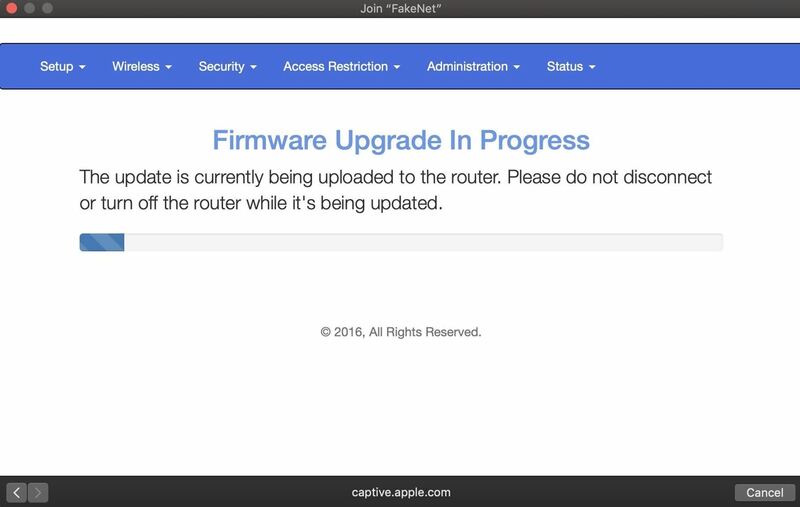 As soon as they join, an official-looking website will be opened with the router's manufacturer informing them that the router is undergoing an important firmware upgrade. The Internet will not work until you enter the password to apply the update. After entering the highly secure Wi-Fi password, a loading screen crawls across the screen when the router restarts and you are a bit proud of the security of your router by installing this important update. After waiting a minute, their devices reconnect to the network, now they are more secure thanks to the installed update. For a hacker, retrieving passwords is as simple as choosing the network you want to target. After you set a destination, Wifiphisher immediately blocks all devices connected to the network. This increases the likelihood that a person connected to the network will be frustrated and will apply the fake update. Next, the network information of the destination is cloned and the spoofed Wi-Fi network is broadcast for the destination to believe the router is in an indefinite update mode. Devices that connect are immediately logged to a list of connected targets. and the phishing page is tailored to the manufacturer of the router by reading the first part of the router's MAC address. After the Wifiphisher persuades one of the destinations connected to the destination network to enter the password, it informs the hacker while blocking the time. After sending the captured password, the target is cruelly busy with a fake update load screen and an incorrect reboot timer to give the hacker time to test the captured password. 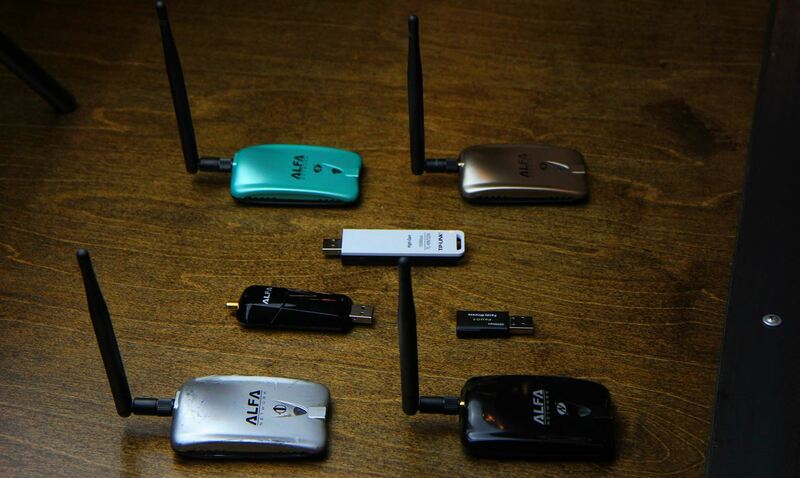 For this attack to work, you need a Kali Linux-compatible wireless adapter. If you are not sure which choices you should make, read one of the guides by selecting one that supports watch mode and package injection. Apart from a good wireless adapter, you need a computer running Kali Linux. You should upgrade this first by performing apt update and apt upgrade . Failure to do so will likely cause problems during the following Wifiphisher installation process. To start, you can open a terminal window and type apt install wifiphisher to install Wifiphisher. 0 updated, 4 reinstalled, 0 removed and 422 not updated. 4,579 kB archives are required. After this process, you will need 10.8 MB of additional disk space. Select the previously unselected package python-pbkdf2. Selection of the previously unselected package python-pyric. Select the previously unselected package python-roguehostapd. Select a previously unselected pak wiper. This should install Wifiphisher, which you can start by entering the program name in a terminal window. You should be able to run the script at any time simply by typing sudo wifiphisher in a terminal window. While Wifiphisher does not have a man page, on its – help page, you can see that there is a pretty impressive list of configuration options that you can change by adding different flags to the command. -nE, --noextensions Do not load extensions. -nD, --nodeauth Skips the deauthentication phase. Remove all BSSIDs in WLAN with this ESSID. Add the WPA / WPA2 protection for the rogue access point. Determine the full path of the log file. Monitor if the destination access point changes the channel. I will use my USB wireless network adapter, so I add a -i flag and the name of my network adapter to the command. Otherwise, Wifiphisher will simply pick up the network adapter. After that, we should see a page showing every nearby network. We can choose which network we want to attack, and then press [Enter] . Next the script will ask Which attack do you want to execute? Select option 2. After you have selected the attack, it will start immediately. It opens a page that listens for targets joining the network. 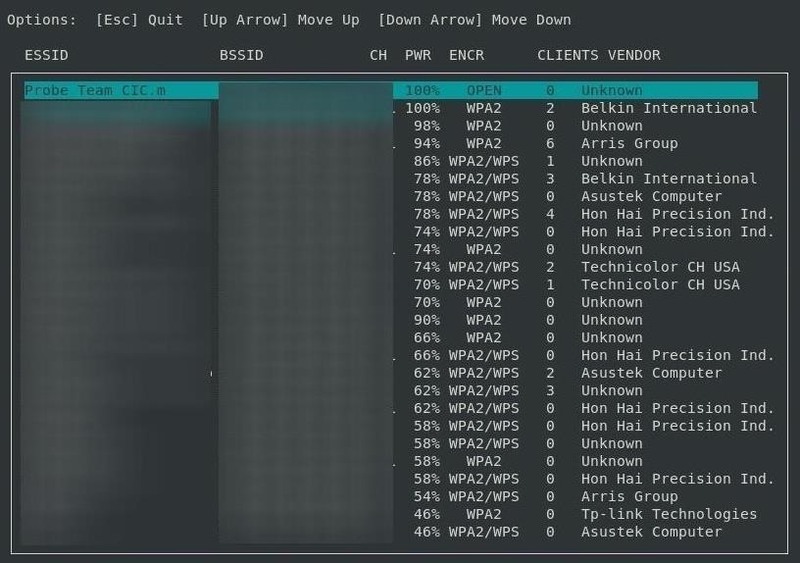 Wifiphisher also looks for devices that try to connect to networks that do not exist and creates fake versions to attract these devices to connect to. After a destination has logged in, a pop-up window prompts for the password. If the destination enters the password, we will be notified in the "Wifiphisher" screen. That's it! The script will exit and show you the password just entered. You've bypassed password security and tricked a user into entering the Wi-Fi password into your wrong network. Worse, they're still behind that dreadful, slow-moving, fake loading screen. If you're looking for a cheap device A handy platform for getting started with Wifipfisher. Take a look at our Kali Linux Raspberry Pi build with the $ 35 Raspberry Pi.